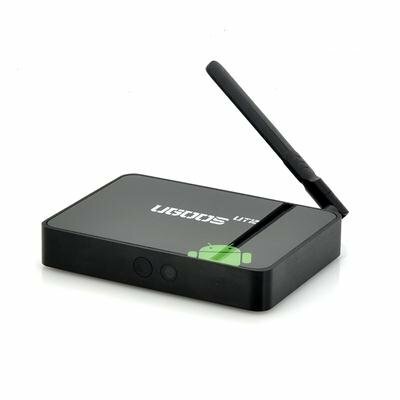 Successfully Added Ugoos UT2 Android TV Box - Quad Core 1.6GHz CPU, DDR3 2GB RAM + 32G Nand Flash, 2.4/5GHz Dual Band Wi-Fi, DLNA, Bluetooth 4.0 to your Shopping Cart. The Ugoos UT2 Smart TV Box is certainly a very diverse system that will change the way you engage with your TV. Where to start? 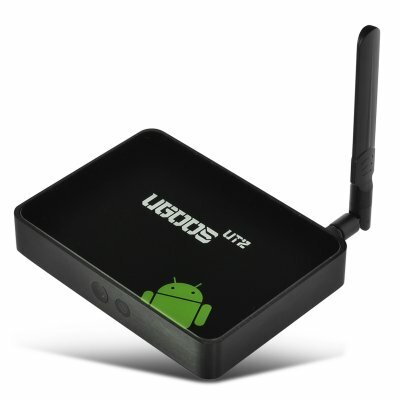 Well, the Ugoos UT2 TV box comes with an Android 4.2 operating system, so straight away you launched into a whole new virtual environment, which is extremely advanced and user friendly. Create new lay-outs, profiles and even personalize this TV box to suit your needs and interests by downloading apps from the plentiful Google Play store. Powering the Ugoos UT2 Android TV box is a RK3188 28nm Cortex-A9 Quad Core that can reach speeds of up to 1.6GHz, so you won’t lag behind when running, streaming or playing content. Joining this powerful quad core processor is an embedded 3D GPU Mali 400 GPU, which is dedicated to focus on your graphic material and make sure it runs smoothly. Also there is DDR3 2GB of RAM and 32G Nand Flash to give the user a top performance each and every time they decide to turn the Ugoos UT2 quad core TV box on. Another cool feature is the dual band Wi-Fi, which has the capability to transmit on the 5GHz and 2.4GHz wireless bands. The 5GHz band is ideal for gaming or video streaming while 2.4GHz has widespread usage and is probably suited better for connecting to your mobile device such as your smartphone. With an array of ports, the Ugoos UT2 quad core Android TVG box can connect or be connected to almost everything, but its secret strength lies in its ability to connect wirelessly to other devices via Bluetooth or DLNA. Digital living network alliance is a wireless way to connect other compatible devices to communicate with each other so you can stream content to your DLNA compatible TV that is in your bedroom while the Ugoos UT2 is attached to your other TV downstairs. In stock now, we guarantee that this Ugoos UT2 Android Smart TV Box can be dispatched within one working day with a 12 months warranty. Brought to you by the leader in electronic devices and wholesale Android TV boxes, Chinavasion.